Thanks to the UO’s LiveMove student organization, 2018 will see the start of some drastic changes to East 13th Avenue between the UO campus and downtown Eugene. 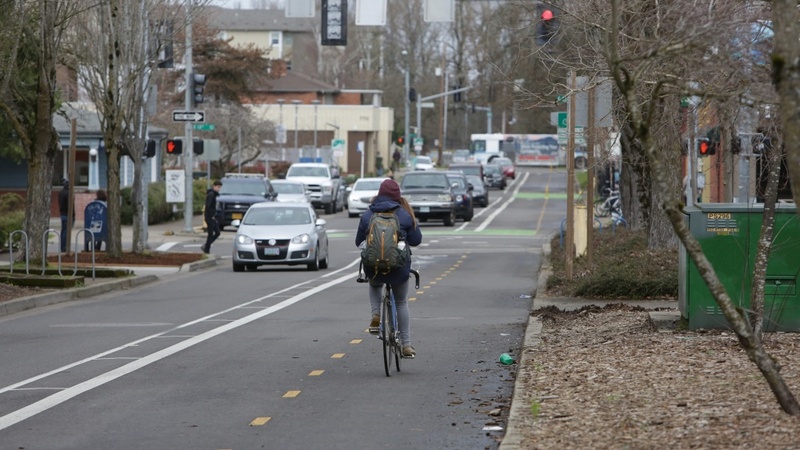 That’s when the city will start work adding a bikeway — a two-way bike lane — to the busy connector, said Reed Dunbar, Eugene’s bicycle and pedestrian planner. The bikeway will be based on plans made by LiveMove students back in 2013. LiveMove is a group focused on sustainable transportation and livability. It’s made up of students from a variety of programs, including planning, architecture and environmental studies. Each year, students in the group choose a project to develop. What will be the David Minor Bikeway was the first, but since then they’ve worked on a traffic garden — a small transportation-themed playground that teaches children the rules of the road — and also worked with Eugene officials to make downtown businesses more bike-friendly, said planning professor Marc Schlossberg, LiveMove’s faculty advisor. The bikeway project began in 2013, just after the Capstone student housing development, now called 13th and Olive, was announced. Developers expected to house around 1,200 UO students. LiveMove was concerned that neither the city nor the university was taking action to address the one-way traffic pattern on East 13th Avenue, the most direct route from the new housing to campus. Students would be able to bike, but they would either have to find another route or go the wrong way up East 13th to get home. The city had marked off East 13th Avenue between downtown and the UO campus as an area of concern, but it hadn’t done anything toward actually making improvements. And Schlossberg thinks they probably never would have. The project really began to pick up steam when Susan Minor heard about it. Her son, David, was a UO student biking home in 2008 when he was struck by a car and killed. It happened on East 13th Avenue. After hearing about the plan to construct a protected bikeway, she called the mayor’s office and pledged $50,000 to the project. The finished route will be called the David Minor Bikeway in honor of her son. However, Eugene city officials weren’t able to simply take the students’ plan and put it into action. Additional research needed to be done. They found that students underestimated the costs of the project. To make the bikeway as safe as possible, planners felt separate traffic signals for bikes were needed. But doing that would require other improvements as well, such as easier access for people with disabilities. Ironing out all the details involved bringing in a consulting firm to determine the bikeway’s effect on traffic, identify necessary improvements and estimate the total cost. The firm has not yet completed its work. Whatever the final project looks like, it is just one of many initiatives that the city is undertaking to improve bike infrastructure in advance of the 2021 IAAF World Championship track and field meet. A bike-share program is in the works, which will lead to more bicyclists, who will need more pathways. And groups like LiveMove, which are focused on making biking safer and easier, figure to play a huge role in what kinds of projects get done.